The market’s arrival on Sunday, April 7 from 7am till noon brings numerous activities for visitors including a special performance from the Baltimore Symphony Orchestra’s OrchKids from 10am to 12pm and giveaways from the Baltimore Office of Promotion & The Arts (BOPA)’s Brand Ambassadors. Plus, the first 100 guests to our Welcome Tent receives a complimentary Baltimore Farmers’ Market & Bazaar tote bag. Can’t make it to opening day? 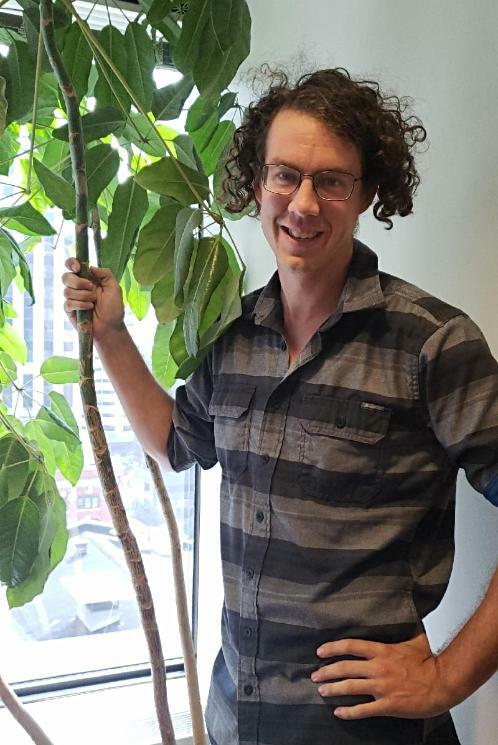 Tune in to the Baltimore Farmers’ Market & Bazaar's Facebook page on Sunday, April 7 at 7:30am for a live broadcast at opening day featuring Farmers’ Market & Bazaar Manager Sam Hanson and BOPA’s Digital Content Coordinator Corey Lacey. Hello and welcome back to market season under the Jones Falls Expressway. This is my first full season as the manager, and I am joined by Sam Huber, Bazaar Coordinator and Will Parker, Maryland Market Money Coordinator. Sam, Will and I couldn’t be more excited for the upcoming season. With new vendors, new programs and the seasonal return of all the Maryland produce you’ve missed throughout the winter, what’s not to be excited about? 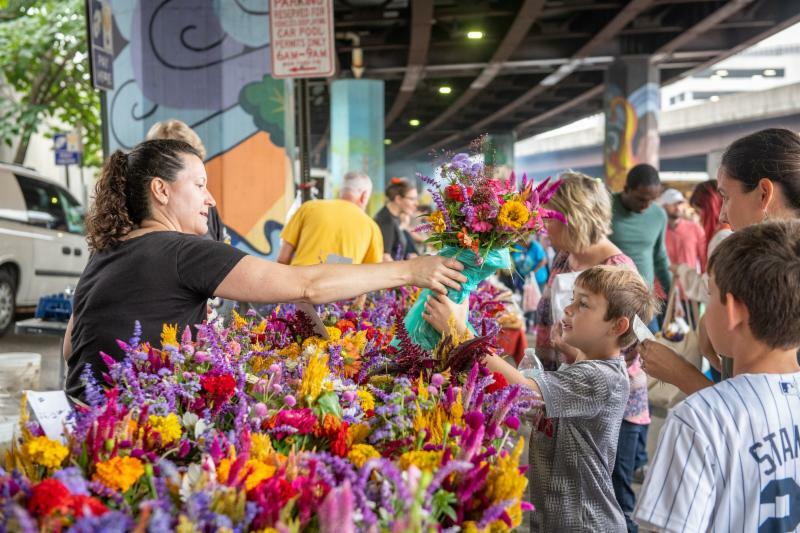 For 2019, the Baltimore Farmers' Market & Bazaar is proud to welcome 148 vendors from across the Maryland region with 19 vendors debuting their produce and products this season. Brooklyn Farm Cajou Cream, DanCandle, Frog Farm Arts, Glass Adornments, Guacamole Specialists, Hemp and Healthy, Lucky Bat Paper Co., Lucky Bean Jewelry, Miller Productions, NEGUS CRE8, Sagamore Spirit, SamunTea Shop, Sporty Dog Creations, Tavon’s Beard Butter, The Salad Lady, Utopian Dreamer and Victorine Q. Adams Community Garden. 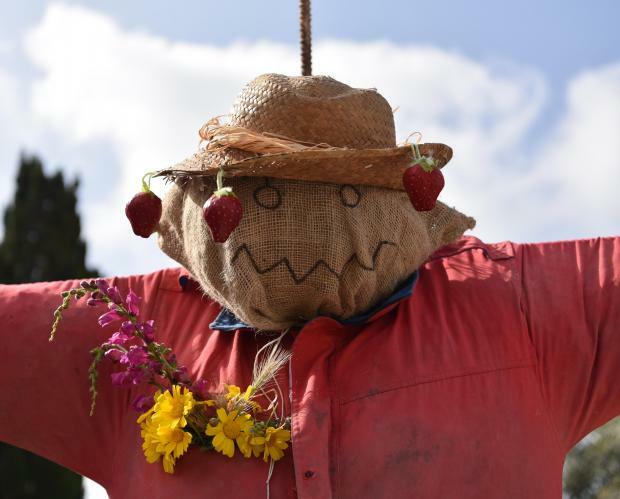 Click here for our full 2019 market vendor list. Spring is lamb season, but since we’re still on the cusp of the weather breaking, here’s your chance to get in one last good slow braise. With a paring knife, make 20 small incisions around the lamb with most on top. Cut five of the garlic cloves in to slivers and place them inside the incisions. Sprinkle the lamb all over with salt, pepper, paprika and onion powder, then drizzle the lamb with olive oil and rub it down. 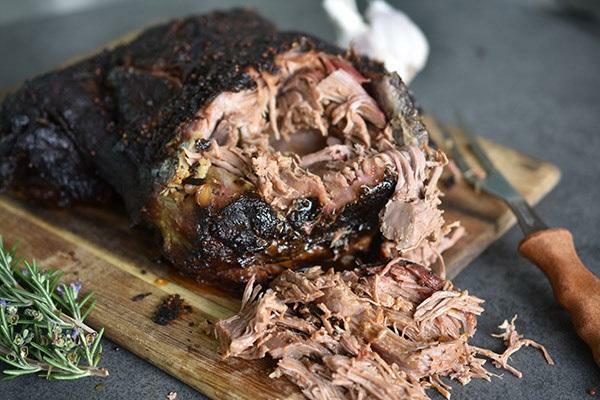 Roast the lamb in a roasting pan for 30 minutes or until it has a brown crust. Remove the lamb from oven and turn the oven down to 350°. Flip the lamb over and pour the liquid ingredients in roasting pan around the lamb. Place the herbs and remaining garlic in the pan as well. With hot water, bring the liquid up a third of the way of the lamb. Cover tightly with a lid or a layer of parchment paper followed by two layers of foil. Bake for 2 ½ hours. Remove from oven and flip the lamb right side up. Re-cover and bake an additional two hours or until meat is tender. Remove cover and roast an additional 20 minutes to brown. Remove lamb from pan and let rest while loosely covered with foil for 30 minutes. Strain pan liquid into a glass-measuring cup and skim the rising fat. Serve lamb with sauce on the side and some fresh spring veggies. From all-beef to all-vegan, the mother-daughter team at Sporty Dog Creations has a hot dog to fit anyone’s taste. 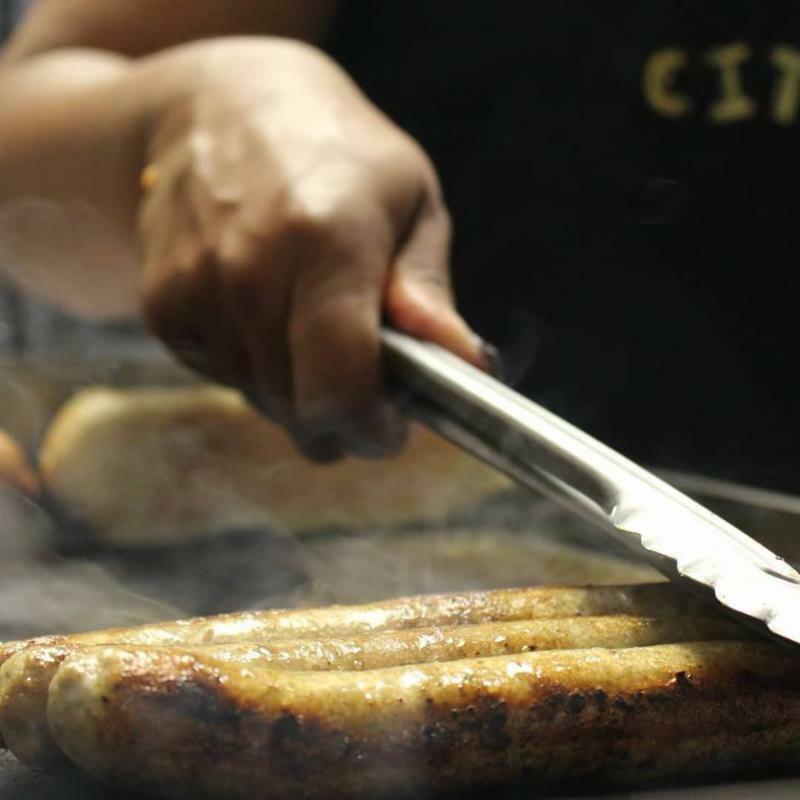 They have been creating uniquely topped hot dogs for more than a year and will join the Sunday morning line-up for the first time this season. ﻿Come see them and try a dog at their stand located on the corner of Fallsway and Hillen Street. An urban oasis in the heart of the city, Victorine Q. Adams Community Garden of Hanlon Park is the newest farm in the Baltimore Farmers' Market & Bazaar line-up. With roots in a vacant lot, the Victorine Q. Adams Community Garden has been transformed and cultivated by the Carlisle Block Association and their volunteers over the past ten years. Now, it is not only a thriving source of city grown food, but also a hub for activities within their community. You can find them in the westside of the market not far from Blacksauce Kitchen. 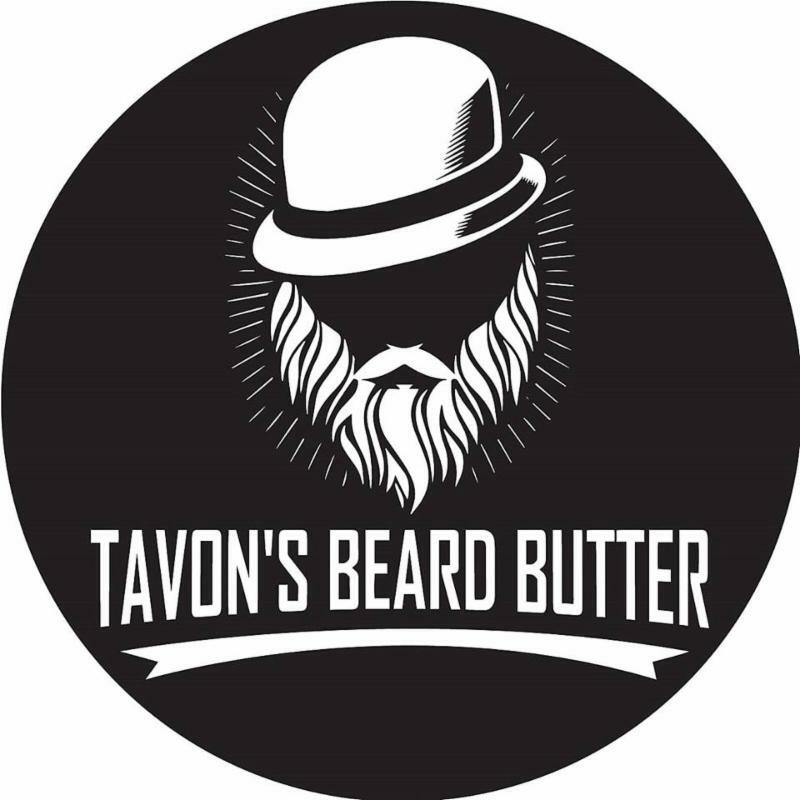 Tavon’s Beard Butter is a 100% all natural ingredient based beard balm created by former New York Jets player, Tavon Mason. Tavon began researching and testing out natural ingredients as a passion project to help care for his own beard. After people started commenting that his beard looked fuller and felt softer, Tavon decided to bottle up the goodness. Tavon's Beard Butter comes in three different scents: lavender & tea tree oil, tangerine and cinnamon. Each scent is derived from a mixture of shea butter, beeswax, jojoba oil and essential oils to keep the beard soft and full. 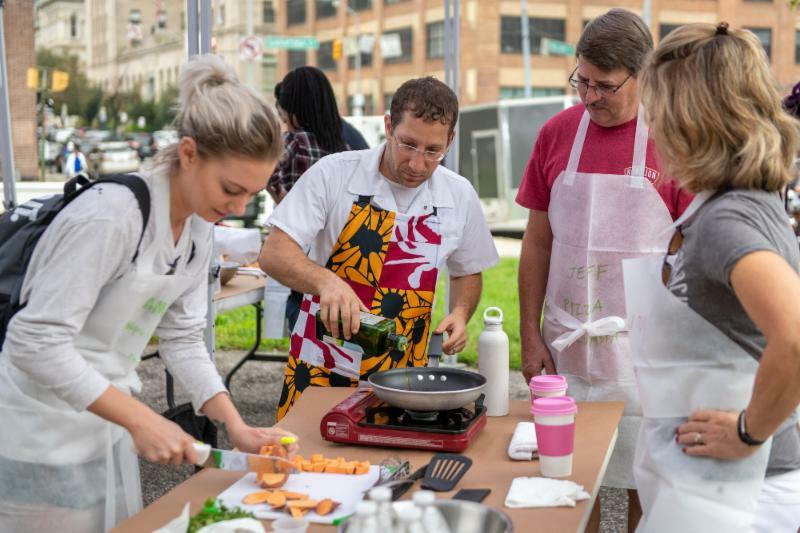 Professionally trained chef and culinary instructor Chef Egg returns to the market every first Sunday for his family-friendly cooking classes. Participants will tour the market to visit vendors before preparing simple recipes made with farm fresh ingredients. Classes are now free from support by Bright StARTS, a BOPA facilitated program that partners teaching artists to provide workshops for Baltimore City youth. *Compliments of Mercy Medical Center, patrons can park for free in the Mary Catherine Bunting Garage, located at 330 Guilford Avenue, Baltimore, MD 21202, for two hours (maximum) from 7am to noon. Vehicles should enter through the Pleasant Street entrance. Bring your ticket to the Welcome Tent for validation. Pets are not allowed at the Baltimore Farmers' Market & Bazaar, and it is a Baltimore City Health Department ticketable offense of up to $1,000.00. 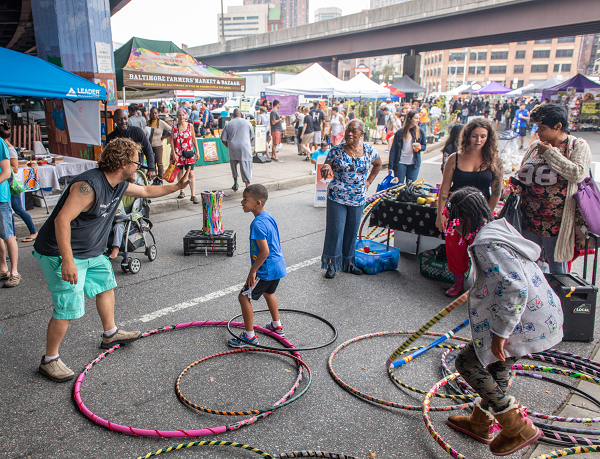 The Baltimore Farmers' Market & Bazaar is produced by the Baltimore Office of Promotion & The Arts, a 501 (c)(3) serving as the city's arts council, events center and film office.